You can create and save Seating Plans, to add seating details to tickets. Eg: Tables + Seats or Rows + Seats. Click Seating to open the Seating Editor. 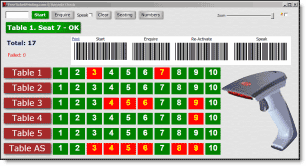 The quickest way to understand how the Seating Editor works is to click a few times to see the Seating Plan created from selected values in the Editor. As each new line is entered, the Ticket Number display will update in the designer as it will be printed. Edit or delete entries from the Editor textboxes and dropdowns and click + to build the Seating Plan, and/or directly edit. For Row or Table prefixes etc, Select A-Z for Letters or 1-100 for Numbers in Table/Row dropdown. Click Save Visual to save and print a visual representation of your seating plan to mark off Seating Positions as Tickets are sold. 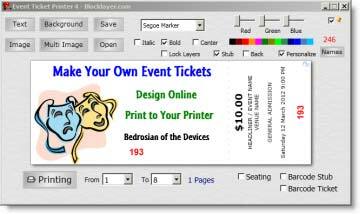 Remember, you can click and drag main ticket number to position, mouse-wheel to resize, select color, font, style etc and right click to rotate to vertical or horizontal. The stub Number is fixed position, but you can click to select and mouse-wheel to resize, and use color selector to color. The best way to see how this works is to load the Demo Seating Plan and click Printing to create a test Print File. Open the file to see how the tickets are Labelled and Numbered. Click Save Seating to name and save your Seating Plan to your computer for re-use later. Click Open and browse to select and open a previously saved Seating Plan. You can create and print a visual representation of the Seating Plan to mark off Seating Positions as Tickets are sold. Click Save Visual to create and save the visual seating plan. See this demo Visual Seating Plan.